NEW! Bootable Encrypted Backups† — creates and maintains a complete, fully-encrypted, instantly bootable backup replacement disk for your encrypted Windows system disk. EXCLUSIVE! Encrypted Image File Backups† — creates, maintains, and restores complete, fully-encrypted disk image file backups for an encrypted disk that can be stored virtually anywhere, including on a drive containing other files or remotely on a network attached storage device. EXCLUSIVE! SmartStart™ — makes the process of backing up or replacing your encrypted Windows system drive faster and easier than ever. EXCLUSIVE! USB Boot Capability† — creates a fully bootable copy of an encrypted Windows system drive that can boot and run directly from an external USB drive. EXCLUSIVE! SmartRestore™ Technology — provides easy, one-step support for restoring a system from a backup. Casper Secure Drive Backup automatically locates available backups, you choose which backup to restore, and Casper Secure does the rest. Casper Secure will even seek out your backups from multiple locations. EXCLUSIVE! Standard User Support — allows running from a standard user account, making it possible to safely and securely create instantly bootable backups and restore-point backups without requiring unnecessary administrator privileges. EXCLUSIVE! Automatic Backup Retention Policy — provides automatic management of image backups to maintain the perfect balance of backups and storage space utilization. EXCLUSIVE! Automatic Pre-Image Verification — ensures all data on source device is accessible before updating an existing bootable backup or non-incremental image file backup. EXCLUSIVE! AccuClone™ Technology — exclusive disk imaging technology designed to enhance performance and virtually eliminate I/O degradation and other problems caused by poorly engineered and misbehaving third-party drivers and applications when imaging a disk within Windows. EXCLUSIVE! SmartClone™ Technology — dramatically reduces the time required to update a backup of an encrypted drive. Innovative SmartClone technology enables Casper Secure Drive Backup to maintain a completely encrypted backup replacement hard disk or encrypted image file backup in the same amount of time required by most traditional backup programs to perform a partial or incremental unencrypted backup of an encrypted drive. EXCLUSIVE! SmartWrite™ Technology — automatically optimizes disk I/O to maximize performance and minimize CPU utilization and Windows resource demands during the disk imaging process. Casper Secure Drive Backup's SmartWrite technology ensures maximum performance and full use of your computer when performing a backup. EXCLUSIVE! SmartResume™ Technology† — provides support for safely resuming an interrupted backup to another disk or image file backup. Casper Secure Drive Backup will even automatically restart a current backup when a soft failure occurs. EXCLUSIVE! Automatic Copy Verification™ — assures the reliability and dependability of the backup by ensuring it is not corrupted during the disk imaging process by faulty RAM, a defective cable, failing disk, or bad controller interface. EXCLUSIVE! SmartSense™ Disk Detection — automatically detects when you attach a new portable drive or an existing backup drive to your computer. Casper SmartSense disk detection technology allows you to begin the process of upgrading or creating and maintaining a backup of your encrypted Windows system drive the moment you attach a new or existing backup drive to your computer. EXCLUSIVE! SmartSense™ Automatic Backups — fully automates the process of maintaining a system backup on a portable drive, making it easier than ever to maintain a complete, instantly bootable backup or system image backup on an external USB drive. Integrated Scheduling — performs backups automatically on a routine basis. Casper Secure Drive Backup's integrated scheduling ensures your backup is always up-to-date. You can schedule backups to be performed daily, weekly, monthly, or at any time desired. EXCLUSIVE! 1-Click Cloning™ — permits routine backups to be performed at any time with a single click. 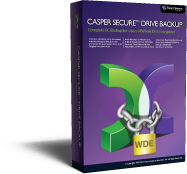 Casper Secure Drive Backup's 1-Click Cloning support makes performing on-demand backups a breeze! EXCLUSIVE! SmartRelease™ — automatically prepares your portable backup drive for safe release after the backup has been completed. Eliminates the need to use the Windows Safely Remove Hardware utility to safely remove your portable drive after a backup. EXCLUSIVE! Casper Backups Folder† — provides support for quickly locating, mounting and managing all of your Casper disk image file backups. EXCLUSIVE! Advanced Power Management — increases scheduling flexibility by using the power management capabilities of your computer to safely resume and then suspend your computer after completing a backup. With advanced power management functionality, you can instruct Casper Secure Drive Backup to wake your computer in the middle of the night to perform a backup completely unattended, and then safely return it back to sleep while you sleep! Automatic Performance Throttling — maintains responsiveness of other applications while Casper Secure Drive Backup performs a backup in the background. Automatic performance throttling ensures the backup process completes entirely in the background without interfering with your work. EXCLUSIVE! SmartAlert™ Notifications — notifies you via email when a backup has been completed or only when a backup requires attention for true “set it and forget it” operation. EXCLUSIVE! Runtime Controls — allows you to quickly change power management and notification options after a backup is underway, regardless of how the backup was started. EXCLUSIVE! GPT and UEFI Support — provides complete support for GPT disk partitioning and UEFI systems. EXCLUSIVE! Solid State Drive (SSD) and Advanced Format Drive Support — ensures optimal performance of solid state and Advanced Format drives by automatically optimizing the alignment of data during the imaging process. NEW! Automatic Volume Resizing — optionally resizes volumes and partitions automatically when cloning or restoring an image to a larger or smaller disk. Designed for Windows — provides complete disk imaging capabilities entirely from within the Windows environment. When you use Casper Secure Drive Backup, you never have to stop what you are doing or restart your computer to create and maintain a complete PC backup. Also, since Casper Secure Drive Backup was designed from the ground up to clone disks directly from within the Windows environment, Casper Secure Drive Backup will never require you to remove the original system or destination hard disk after completing a copy — the source and destination hard disks can coexist on the computer at all times! Advanced Disk Management — provides advanced disk management functionality. Use Casper Explorer to review past activities performed with Casper Secure Drive Backup, create and remove encrypted and unencrypted partitions from whole disk encrypted disks, change the active partition, change a drive letter assignment, replace damaged or missing boot records, and more. Enterprise Scripting and Automation Support — provides scripting and automation support to enable custom interface design, operation and integration within an enterprise. Group Policy Administration — gives system administrators complete control over functionality to make available to standard users. Native 64-bit Support — provides true 64-bit performance on Windows 64-bit platforms, including 64-bit editions of Windows 10, Windows 8, Windows 7, Windows Vista and Windows XP Professional x64 Edition. † Please see System Requirements. Casper SmartResume™ feature is currently supported only on volumes formatted with the NTFS file system.